Wars have been fought, people have been killed, blood has been spilt and alliances have been broken over people in power deciding who can claim ownership over certain pieces of land. While the violence may seem senseless, and the endless fighting may feel futile, the stories birthed from the confined trenches and claustrophobic strongholds reach far and wide. Many a brave soul has taken up arms and left their family behind to voluntarily call these limited spaces home, so that citizens like ourselves can call the four walls we live in, our homes. Kesari chronicles the story of 21 such brave SIKH (and don't you dare forget it) souls defending the fort of Saragarhi against an onslaught brought forth by nearly 10,000 Pathani tribesmen. While Akshay Kumar's latest film might not have an endless sea of scantily clad men with their sculpted abs out for the world to gawk at, it does have a band of men who fulfil every war movie stereotype in the book, an effeminate Persian sharpshooter and a sprinkling of British oppression. Akshay Kumar plays Havaldar Ishar Singh, a man who does right by his fellow soldier, does right by his enemies (by saving their women and aiding their wounded) and does right by nature itself (by practising sustainable farming). Sadly, the makeup department doesn't do right by him, by making him sport a comically well-kempt fake beard, but then again, he had to have some character flaw to make his character somewhat akin to a normal human being, didn't he? Ishar Singh faces the wrong end of a transfer order after disobeying the orders of his superior officer, and is sent packing to the uneventful Saragarhi fort. A lonely structure that acts as a conduit that delivers messages between the Gulistan and Lockhart forts. While the last stand taken up by the soldiers is well documented, their personal stories are not. The movie's screenplay attempts to plug those holes. At three specific moments, two in the first half and one in the second, the film ruminates on the paradox of war. There is Ishar Singh callously talking about war as a domestic dispute that one tends to blow out of proportion, an old man telling the audience about the financial powerplays that dictate nations fighting against each other, and the plight of a young soldier with no combat experience forced onto a battlefield. The film acknowledges that wars are fought by boys at the behest of men, and thoughtful observations like this one are lost in a sea of occasionally misplaced feelings of patriotic and religious fervour, and a barrage of ear-shattering screams. Like a contingent of wedding guests asking for second servings of the five items that caught their attention instead of the remaining 10 that will most definitely be wasted on the plantain leaf, Kesari's storytelling is not better than the sum of its individually compelling parts. Short scenes of Ishar Singh expositing the root of the pride and humanity of the Sikh people form a far more compelling narrative than the movie's script. Kesari's calls for national unity ring a tad hollow as we have observed Ishar Singh's cynical take on war. His heroic last stand seems more in service of his community than any other secondary motivation the movie hastily cobbles together. Then again, we learnt a lot of Sikh culture in this over two-hour crash course, and for that we are grateful. If only we learnt of this battle in our history textbooks than on the silver screen. But that little hurdle doesn't stop Kesari's set designers, costume designers and cinematographer from immersing the audience into the harsh and unforgiving turf the characters find themselves in. The simple choice of muting the colour palette by aligning the colour of the soldier's uniforms and the colour of the ground below helps in making Ishar Singh's saffron turban stand out. Sporting that turban on his head and carrying the movie squarely on his shoulders is Akshay Kumar, who still commands a high degree of attention when on screen. Even though his character lacks depth and layering, his bombastic performance makes you sit up and take notice. That being said, the lesser we speak of the secondary characters the better. While all these men might have had stories worth telling, they are reduced to one-dimensional cannon fodder whose deaths you see coming as soon as they are introduced. They are strong, brave, courageous and any other boilerplate word used to describe an army man, but are not shown to be happy, sad, remorseful, empathetic, disillusioned and so forth. Add this to one of the most paper-thin villains in cinema history and you have a recipe for a movie that must put style over substance in order to evoke a reaction from the audience. Cue the ninja spin moves, hyper-edited action sequences designed to hide the actor's lack of combat training, glory shots of mangled corpses and gratuitous violence. These sequences form a bulk of the film, and are designed to appeal to an audience in one way and one way alone. The movie has a nuanced take on the paradox of religion as it highlights fake godmen, caste divides that split up people of the same religion, and the sense of direction following a certain way of life affords. But Kesari does not afford the same nuance when it raises its guns as every take on morality it has hits a dead-end faster than a bullet hitting a man's body. If none of these overly-indulgent philosophical readings concern you, we suggest following the star. That man in the saffron turban that stands out in the dusty battlefield, follow that man. He's the hero. He's in the right, and hopefully he does right by you as he has done with everyone else in his life. 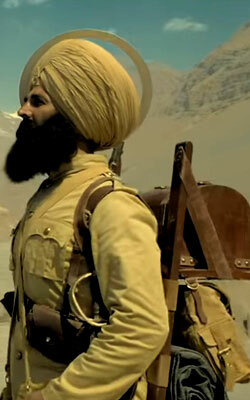 Be the first to comment on Kesari! Just use the simple form below. fullhyd.com has 700,000+ monthly visits. Tell Hyderabad what you feel about Kesari!